Being diagnosed with a mental illness may not be a positive thing. However, if you look at the diagnosis in a positive way, you most likely will do better than someone who takes the diagnosis in a negative way. It is not fully understood why a positive attitude helps people recover more quickly from surgery or cope better with illnesses. However, evidence suggests that positive thinking does help. Positive thinking is not something that comes naturally to everyone. In fact, many people develop negative thinking early in life and don’t even realize it. While depressed, it is easy to get caught up in negative thinking. People may tell you to snap out of it. However, that is almost impossible to do. 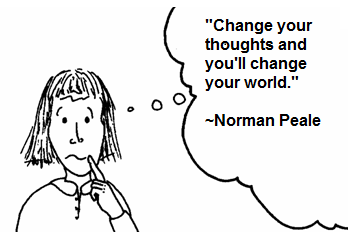 However, if you put effort into changing how you think about things it will help. Every day, you should try and think positive thoughts. Although it is hard while depressed, it is important that you try. Read positive quotes. You may want to write them down and hang them up on your mirror or refrigerator. Journal and talk about positive things in your life and positive things about yourself. You may want to do this when you are not depressed so that you can reflect back on these things when you are depressed. Limit watching television. If you do watch tv, don’t watch the news as that can be depressing. Pick shows that make you laugh. Call a friend who will make you smile. Set small goals every day and do them. At the end of the day, you will feel like you accomplished something. Treat yourself to something that you enjoy eating once in awhile. Live in the moment. Deal with your problems as they arise and then leave them in the past where they belong. Start a thankful journal. Write 1-3 things you are thankful each day. At the end of the week, you could have 21 things you are thankful for. It can be so easy to be trapped in negative thinking while depressed. The longer you think negatively, the longer you will remain depressed. It is easy to dig yourself into a deep hole and the longer you stay in that hole, the harder it will be to get out of it. If you are skeptical about if positive thinking can help you with your struggle with bipolar disorder, it won’t hurt anything to try. Start thinking positively now and give it a try. This entry was posted in Uncategorized and tagged bipolar disorder, depression, depression tips, mental health, mental illness, positive thinking. Bookmark the permalink. I just printed this for my son. Thanks! Being positive makes a huge difference. Hi Michelle really liked what you wrote.My father suffered bipolar illness and I have to fight anxiety and depression during stressfull conditions. I garden ,exercise,read and try positive thinking, meditate and count my blessings when the going gets tough. I believe just like physical health,mental health needs nurturing too .By writing this blog you are helping others and by the effect of karma you will also be helped.